Wide pouring edge for drip-free pouring. 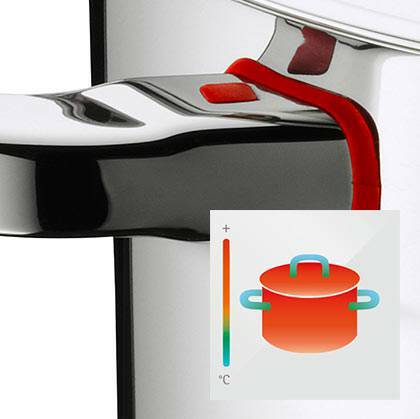 Patented Cool+ technology: Effectively reduces the heat transfer from the pot to the handle. Steam opening in the lid - prevents accumulation of calcium, uncontrolled steam emergence and water splashing onto the stove. The elegant design of the Quality One series is the result of one man and his idea to convey the harmonious lines and clear shape of the pans through their outstanding functionality. Peter Ramminger aspires to create products that simplify cooking and improve everyday life in the kitchen. Visually, the pans cut a fine figure with their bulbous shape, curved handles and domed lid. They also excel in terms of craftsmanship. The stainless steel handles stay cool thanks to patented Cool+ technology – instantly recognisable by the bright red dots. Other beneficial features include an insertable lid made of high-quality, heat-resistant glass, which sits firmly in the pot and releases steam through three small vents. A wide pouring rim also ensures the drip-free pouring of liquids. The TransTherm® universal base is suitable for use on all hobs, including induction, and the rust-free Cromargan® pans can be cleaned in the dishwasher. The series includes a deep stockpot, which is perfect for soups, stews and spaghetti, deep and shallow casserole pans as well as saucepans in various sizes.